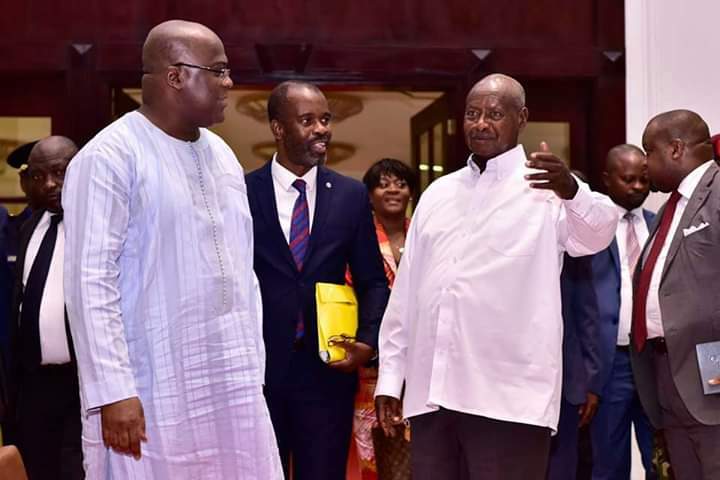 President Yoweri Museveni last evening hosted the newly elected DR Congo president Felix Tshisekedi at State House Entebbe. The two leaders discussed trade, regional security and other areas of bilateral interest to Uganda and the neighbouring DR Congo. “President Museveni later hosted President Tshisekedi to a dinner,” read the statement from State House without giving further details. “Last evening, I hosted His Excellency Felix Tshisekedi at State House Entebbe. We discussed trade, regional security and other areas of bilateral interest to Uganda and the DR Congo,” Museveni confirmed on his twitter page. This is the second time the two leaders are meeting in less than six months. Mr Tshisekedi met Museveni before the election was held in DRC where he was chosen to in January this year to replace Joseph Kabila, who had ruled the country for 18 years. Tshisekedi visit is a boost for Uganda especially on the trade front, following Rwanda’s imposing a trade embargo Ugandan goods.